Our cats are very clean and careful creatures, so if your pet has started to spray somewhere away from their usual spot - such as against a wall, door, furniture or on another vertical surface - they may be trying to communicate something! Spraying is not limited to any cat in particular - both male and female cats sometimes spray. Even if your cat has been spayed or neutered (which can prevent hormonal influences and can keep them healthier), they may sometimes show spraying behaviour. However, though there are several reasons why your cuddly kitty might occasionally spray, it can be unpleasant when it happens around your home! Understanding the cause of spraying is the first step to limiting it. So to help, we’ve listed some common causes of unexpected cat spraying below. If your kitty seems to be messing accidentally or has suddenly changed their behaviour, it’s a good idea to check that nothing’s wrong with their health. Sometimes spraying can be caused by an underlying health or medical condition, such as cystitis or sterile cystitis which is no fun for your pet! Arthritis or age can also create discomfort and cause your cat to urinate outside the litter box. So if you notice anything unusual, it’s important to get your furry friend checked by the vet to rule out any medical issues. Is the litter box clean enough? Cats are very clean creatures. So if their litter box is not as clean as they like, they might not use it. 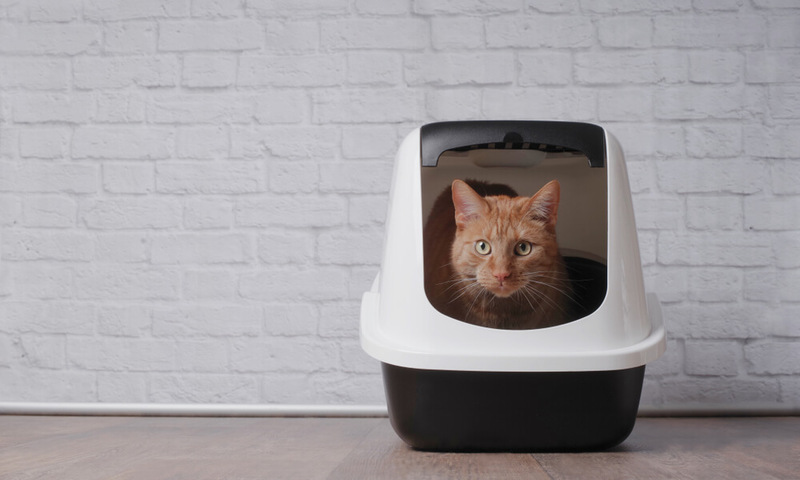 Is the litter box always in a room that is accessible to your cat? They need easy access at all times - and won’t just ‘hold it’ if they need to go, and can’t get in! Is the litter box too high up? This might make it difficult for your pet to access, particularly if you have a more senior cat. Have you tried a different type of litter? Sometimes, the answer is as simple as your kitty’s preferences! They may dislike the litter you’ve chosen - so try using a different type to encourage them to use the litter box. How many litter boxes do you have in your house? If you have multiple cats, you might not have enough! It’s best to have one more litter box than the number of cats. If one of your furbabies is a little on the shy side, make sure they have easy access to their own litter box. This should be somewhere quiet and out of the way where your cat won’t be interrupted. Like a lot of humans, cats also like to feel in charge! If they not feeling completely happy, or are facing any stress or anxiety, this can cause them to spray. The act of spraying along with the smell, makes them feel more confident. So sometimes, spraying may be due to a change in your cat’s routine or lifestyle - your furry pal is a creature of habit and doesn’t like change! If you think stress might be the cause, try to identify what’s making your cat feel unhappy. For example, there might be a scary neighbour cat outside the window, so shutting blinds or windows would stop your cat feeling intimidated. Your puss might also be lonely so would benefit from play at a regular time, when you can give them lots of love and affection. If your cat has a favourite spraying spot, the scent could be attracting them back for a second spray. To discourage this habit, you should clean the area where your cat has urinated with a simple soap and water, or use a recommended urine stain and odour remover. Don’t use ammonia-based or bleach cleaners as this will attract your cat back to pee again. If you’ve ruled out illness and other stress factors, the best way to stop spraying is to provide your cat with a calming and comforting environment. FELIWAY CLASSIC Diffuser is clinically proven to comfort cats at home and decrease urine spraying. It is the ideal solution to help your cat feel secure in their environment, making both you and your cat happier! You can also consider using FELIWAY CLASSIC Spray if your cat keeps spraying in one single place - this should be sprayed on the area at least once daily. Making your kitty feel comfortable in your home will stop them from spraying from stress, and bring you both closer together.